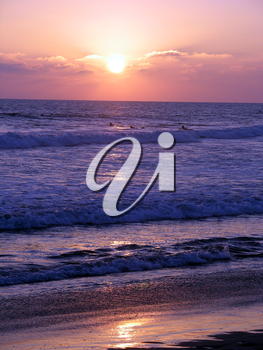 Vital Imagery Blog: Sunrise, Sunset. Can You Tell the Difference? Generally speaking, as far as I can see, the only difference between a sunrise and a sunset is the distance you're facing. They are both things of beauty, full of colour and inspiration. While there is no natural cause for an optical difference between the two, there is, however, according to the authors of Color and Light in Nature (Cambridge Press 2001) human factors that affect our perception. At dusk, after a day spent in daylight our eyes don't adjust quite as swiftly to the darkening sky so some of the hues might be lost. At dawn, though, our acute night vision sees every hue, every slight alteration in colour. True perhaps, but it certainly doesn't take anything away from the grandeur of either. I admit I have caught more sunsets in my time than sunrises and rarely find them anything but awesome. Likewise, have been the few early mornings when I've been up to watch to the brightening sky. These natural phenomena are the perfect start and end to a day, a photographer's dream, a nature lover's ideal. They inspire even the busiest among us to pause for a second and enjoy the display. They are omnipresent and glorious. The collections of wonderful photos I share here capture that beauty. Whether they were taken at morning or night really couldn't matter less to me.